Discover a world of mystery, history, and lore inside your mouth. In Open Wide, you'll find out everything you need to know about your teeth. Pearly whites, chompers, canines, tooth fairy bait, no matter what you like to call them, teeth play a vital part in your life and have an interesting past. 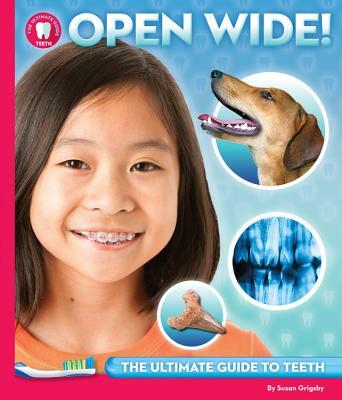 In Open Wide, you'll find out everything you need to know about your teeth; from what ancient civilizations believed about teeth, to how scientists use teeth to learn about past societies and solve investigations in the present. With helpful diagrams and tips, you'll learn how to keep your smile happy and healthy. You will even learn how to keep your pet's teeth clean and pristine! No more smelly dog breath for your four-legged canine friend! What's in store for our teeth in the future? Could it be possible that they'll change someday? Read Open Wide to find out!